Barack Obama’s economic team is in serious jeopardy of getting bogged down as they attempt to extricate America from the “toxic asset,” bad bank and financial crisis.The objective is to get lending going and they centerpiece is trust and confidence. Obama is banking that his strong poll numbers will translate into the public trust and confidence he’ll need to reform, some say overhaul, and some say radically attack the financial system and Wall Street. But pollster Frank Luntz and others say although the public approves of Obama himself, they reject some of his policies. It could just be that Geithener, Larry Summers and Barney Frank are ill suited to carrying the load they are under. And then again, maybe they created a load that is a load of c**p.
The Geithner, Summers, Obama plan may be too radical, too complex and too elusive to even explain — if and when the details become known…. “You’re talking about seizing private businesses and you don’t consider that radical?” Manzullo [Rep. Donalsd Manzullo; R-Ill] replied, his voice rising. Manzullo is trying to get [Treasury Secretry Timothy] Geithner to give details of the plan — that’s where Geithner got stung before — but Geithner doesn’t have them yet. For example, private equity investors might try to buy large hedge funds and chop them into funds that would be small enough to operate unregulated, Reinhart said. 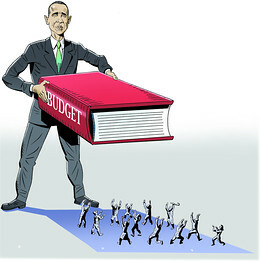 Treasury Secretary Timothy Geithner, unveiling the plan Thursday, said the nation’s economic crisis demands bold action. “We need much stronger standards for openness, transparency and plain commonsense language throughout the financial system,” he told the House Financial Services Committee. Obama Still Thinks After Economy Recovers; Bank, Finance Good Times Can Return? There is just too much on the plate here to swallow. Listen for more such positive tweaks in coming days. It’s bad. But we’re strong. If we can go to the moon, we can automate all medical records and cover everyone with health insurance and reform the country’s education system and stop foreclosures and expand the war in Afghanistan and create a federal deficit with more zeroes than most civilian calculators contain and then cut the deficit in half by giving 95% of Americans tax cuts and sticking it to a few rich people. And the only thing we have to fear is fear itself. That and, perhaps, China calling in all its loans at once. Oh, and cure cancer, solve global warming (if it is the disaster Al Gore claims) and rid ourselves of oil, gas and coal. Frankly, my dear, I do give a damn. And I give a damn about working on jobs, banks and the economy first: without fixing the “cisis” we cannot afford to fix the rest of the country and the world…..
And the swallow Obama media can’t be too smart: many of the newspapers that got behind Obama early and without criticism are now going out of business. Even consevative talk radio guys that haven’t had the impact of the “Obama boost” inthe form of Rahm Emanuael’s orchestrated attacks, like Rush Limbaugh, are failing. Mitch McConnell and other Republicans need to fight the Obama plan, slow down all non essential legislation, and get people to listen. Then need to set down principles the way Newt did in the “Contract with America” and they need to stick to them the way Ron Silver did even when Hollywood wouldn’t hire him. Principles, sticking to principles and getting the word out will work. It worked before. Optimistic official comments from China’s annual legislative meeting are highlighting the country’s differences with major Western economies caught in the worsening financial crisis. China’s economy hasn’t turned the corner into recovery — housing sales, construction and manufacturing continue to contract, and the worst is almost certainly still to come for exporters hammered by downturns in U.S. and European demand, with February trade figures next week expected to show a sharp decline. But while financial systems sag in many countries, Chinese banks — state-run, stodgy and opaque though they may be — continue to pump money through the economy. Along with flush household savings and solid corporate balance sheets, that is sparing China from the liquidity crunch and credit collapse savaging other nations. “It’s just one crisis, not two” for China, said Ben Simpfendorfer, an economist for Royal Bank of Scotland. Because they don’t have to restructure their financial system, he said, Chinese authorities can focus on re-accelerating economic growth with measures like the 4 trillion yuan ($585 billion) investment plan the government announced in November. It’s hard not to see the continued sell-off on Wall Street and the growing fear on Main Street as a product, at least in part, of the realization that our new president’s policies are designed to radically re-engineer the market-based U.S. economy, not just mitigate the recession and financial crisis. The illusion that Barack Obama will lead from the economic center has quickly come to an end. Instead of combining the best policies of past Democratic presidents — John Kennedy on taxes, Bill Clinton on welfare reform and a balanced budget, for instance — President Obama is returning to Jimmy Carter’s higher taxes and Mr. Clinton’s draconian defense drawdown. To be fair, specific parts of the president’s budget are admirable and deserve support: increased means-testing in agriculture and medical payments; permanent indexing of the alternative minimum tax and other tax reductions; recognizing the need for further financial rescue and likely losses thereon; and bringing spending into the budget that was previously in supplemental appropriations, such as funding for the wars in Iraq and Afghanistan. The specific problems, however, far outweigh the positives. First are the quite optimistic forecasts, despite the higher taxes and government micromanagement that will harm the economy. The budget projects a much shallower recession and stronger recovery than private forecasters or the nonpartisan Congressional Budget Office are projecting. It implies a vast amount of additional spending and higher taxes, above and beyond even these record levels. For example, it calls for a down payment on universal health care, with the additional “resources” needed “TBD” (to be determined). Mr. Obama has bravely said he will deal with the projected deficits in Medicare and Social Security. While reform of these programs is vital, the president has shown little interest in reining in the growth of real spending per beneficiary, and he has rejected increasing the retirement age. Instead, he’s proposed additional taxes on earnings above the current payroll tax cap of $106,800 — a bad policy that would raise marginal tax rates still further and barely dent the long-run deficit. Increasing the top tax rates on earnings to 39.6% and on capital gains and dividends to 20% will reduce incentives for our most productive citizens and small businesses to work, save and invest — with effective rates higher still because of restrictions on itemized deductions and raising the Social Security cap. As every economics student learns, high marginal rates distort economic decisions, the damage from which rises with the square of the rates (doubling the rates quadruples the harm). The president claims he is only hitting 2% of the population, but many more will at some point be in these brackets. As for energy policy, the president’s cap-and-trade plan for CO2 would ensnare a vast network of covered sources, opening up countless opportunities for political manipulation, bureaucracy, or worse. It would likely exacerbate volatility in energy prices, as permit prices soar in booms and collapse in busts. The European emissions trading system has been a dismal failure. A direct, transparent carbon tax would be far better. The bad mortgages that got the current financial crisis started have produced a terrifying wave of home foreclosures. Unless the foreclosure surge eases, even the most extravagant federal stimulus spending won’t spur an economic recovery. The Obama Administration is expected within the next few weeks to announce an initiative of $50 billion or more to help strapped homeowners. But with 1 million residences having fallen into foreclosure since 2006, and an additional 5.9 million expected over the next four years, the Obama plan — whatever its details — can’t possibly do the job by itself. Lenders and investors will have to acknowledge huge losses and figure out how to keep recession-wracked borrowers making at least some monthly payments. So far the industry hasn’t shown that kind of foresight. One reason foreclosures are so rampant is that banks and their advocates in Washington have delayed, diluted, and obstructed attempts to address the problem. Industry lobbyists are still at it today, working overtime to whittle down legislation backed by President Obama that would give bankruptcy courts the authority to shrink mortgage debt. Lobbyists say they will fight to restrict the types of loans the bankruptcy proposal covers and new powers granted to judges. The cost of the bank bailout is likely to be much higher than $700 billion. While the Obama administration hasn’t asked Congress for more money yet, some experts warn that government spending on support for struggling financial services companies will ultimately reach into the trillions of dollars. The first half of the controversial $700 billion program to help banks has already been spent — mostly on buying up preferred shares of troubled banks. And while taxpayers will surely recover some of that sum eventually, more money is likely to be needed in order for the bank rescue to work. “The amount of working capital you’d expect the government to take into this would be around $3 trillion to $4 trillion,” said Simon Johnson, a senior fellow at the Peterson Institute for International Economics and author of its Baseline Scenario financial crisis blog. Johnson, who until last year was the chief economist at the International Monetary Fund, said that banks will need more rounds of capital from the government because their cushion against losses is too thin. He also said that there is a need to get rid of some of the toxic assets weighing on financial institutions before they can recover. The Federal Reserve, gave a bleak outlook for the U.S. economy, saying that while it expected a “gradual recovery” to begin later this year, significant risks remain. Fed Chairman Ben Bernanke and his colleagues are battling a three-headed economic monster: crises in housing, credit and financial markets that — taken together — haven’t been seen since the 1930s. The dawn of the Obama presidency could not shake Wall Street Tuesday from its dejection over the banking industry’s growing problems. After hearing the new president’s inaugural address, investors continued selling, sending the major indexes down more than 2 percent. Traders on the floor of the New York Stock Exchange paused at times to watch the inauguration ceremony and Obama’s remarks, but the transition of power cdidn’t erase investors’ concerns about the struggling economy. Obama said the economic recovery would be difficult and that the nation must chose “hope over fear, unity of purpose over conflict and discord” to overcome the worst economic crisis since the Great Depression. Investors are expecting Washington will be a central part of the economic recovery. But the first few minutes of Obama’s term did little to ease their concerns. Investors already nervous about the state of U.S. banking were rattled by the Royal Bank of Scotland‘s forecast that its losses for 2008 could top $41.3 billion, the biggest ever for a British corporation. The British government injected more money into the struggling bank Monday. The government also announced another round of bailouts for the country’s banks. You are currently browsing the archives for the lending category.